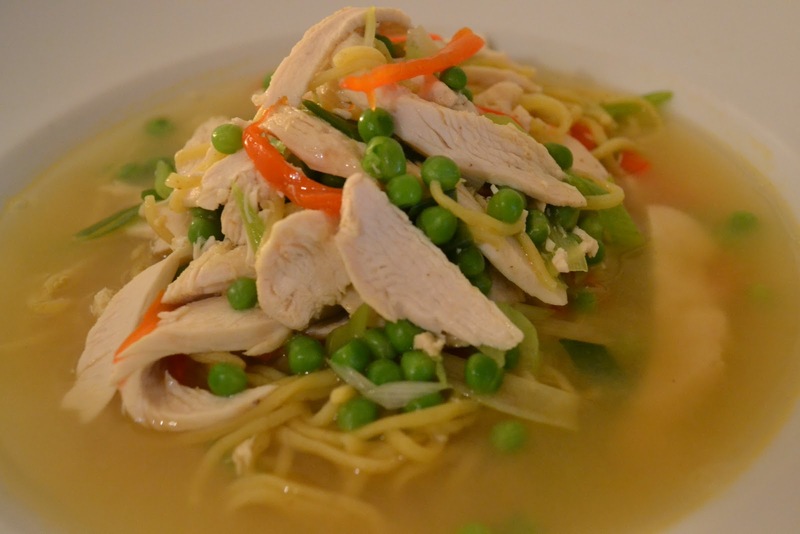 The best Chicken noodle soup I ever had was standing in Times Square in a drizzle. It was just getting dark and the place was lit up like a Christmas tree, this was an assault on the senses – my first time in New York and my first time having New York Chicken Noodle soup…..died and gone to heaven doesn’t cover it. I’m sorry to say I have had chicken noodle soup many times since New York and it’s been awful…..in my opinion only New Yorkers can make proper CNS. This recipe is just my twist on this classic, nothing more…in fact I probably shouldn’t even call it Chicken noodle soup….but what the hell. Bounce off by bringing the chicken broth to a rolling simmer and sling in the chicken – let it gently cook out for 10-15 minutes or until the chicken is cooked through. Remove, cool and shred, sling back into the broth along with the pepper, spring onion, noodles, peas, chili and ginger. Considering I was at a Bruce Springsteen gig last night and I’m very delicate today this is the greatest tonic known to man.